Singer-songwriter and guitarist Dana Lyons’ lyrics can be darn funny and downright moving. He sings passionately from his love of the Earth. This show opens with Dana’s rich deep voice singing his signature “Cows with Guns.” Listen closely to the hilarious lyrics! He talks about stopping coal trains in his own Pacific Northwest community, as well as protecting salmon among the native people in Alaska and orcas in the Salish Sea. 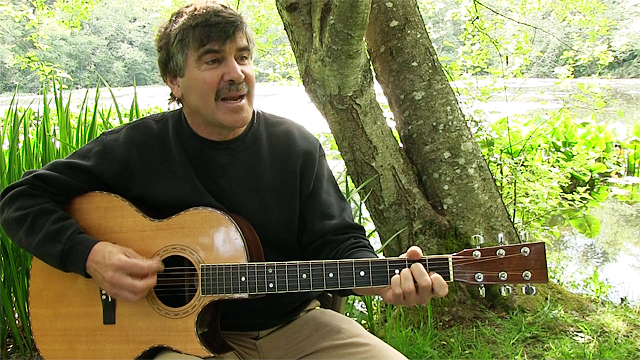 This musician-activist uses song, humor, ballads and stories to urge people to protect their communities, economies and environments. Don’t miss his singing one of Janaia’s favorites at the end, “Salmon Come Home.” His extensive tour schedule, music videos, and songs free for the listening are at cowswithguns.com.